Here is the first edition of one of my article-series, “Prod. by BLACKCATHOLIC.” Series synopsis: I write for other Catholic platforms too. When I have articles published elsewhere I will have some of them previewed here and will provide a link to the full article on the original site of the post. It’s the beginning of the new liturgical year, and with it comes a renewed chance to deepen our relationship with Our Lord. There are different seasons within the Church year celebrating different events in the life of Jesus and themes of the Christian life, but in the midst of the changing liturgical year there is at least one constant: the Eucharist. Whether we are preparing for Christ’s birth in Advent, stripping our souls bare in Lent, rejoicing at the Resurrection, or achieving steady growth of soul during Ordinary Time, Jesus accompanies us in the Eucharist throughout the year. To my knowledge, there is a Mass every single day of the year except on Good Friday no matter what the season may be (correct me, if I am wrong). The start of the Church’s calendar is a great time to begin contemplating how God sticks around the whole year. Here are excerpts from at article I wrote for uCatholic earlier this year during Ascensiontide (the ten days after Ascension Day to the eve of Pentecost) discussing this point. I have selected more of the Advent-themed bits. Be sure to check out the full thing through the link I will provide at the end. Some [commentary] is added. This most glorious time of Easter has been going on for quite a while now, but I wonder if this fact is often overlooked as we hustle through the liturgical year. This thought reminds me of another time in the Church’s year where a tremendous event happens, yet it can be easy to forget that it happened at all a week later in the quest to move forward in both our secular and religious calendars. Think back to Christmas. Of course, we remember how it came with great anticipation, but, just as I wrote in an article for Laudare Outreach Ministries in 2016, during that time of the year “it too often appears that when Christmas Day comes everything seems to be over the next day – even for us Christians.” I went on to say, “Our Lord, the King of the Universe, God Himself, has just made it to His crib, and we are already off to the next thing, celebrating another babe (Baby New Year).” “Even the secular world can be found still ‘celebrating’ Christmas, or at least the ‘holiday season,’” I remarked, “with its gleeful offerings of sales and 50 percent markdowns” after Christmas day has come and went. But the truth is that Christmas Day after the long time of Advent, like Easter after Lent, is only the beginning. As a side note, I continue to say that Christmas and Easter “stopping”altogether after Jesus has been born or has risen from the dead can be a serious problem among the faithful. After all, there is still Christmastide from the Birth of Jesus to the Feast of His Baptism and Eastertide from His Resurrection to Pentecost (as stated above), so there is still plenty to gaudete and laetare about during these times! [I think the point I made about how Christmas is typically celebrated and the “stopping” the day after on Dec 26 is very key. In recent years I have started to ponder how much the secular world revs up for Christmas. We see stores get Christmas stuff up earlier and earlier every year. SO MUCH anticipation is built up leading up to the final moment, and for what? Electronics? Appliances? Cars? Jewelry? Toys? Material things that we just get used to soon after? After that, then what? Dec 26, and it’s all over. Now, I am not railing against gift-giving and buying gifts – these are certainly not evil in themselves. Go out there and get them deals, y’all. There is still something magical about this time even in how the secular world celebrates it. But consider that all of this fits in a particular context, and that context is the answer to the question of why this time of the year matters at all. If you are a Christian, gift-giving and all the rest of the hub-bub are only the minimum of this season. We are called to all things greater in the order of grace. Take a lesson from Lent’s corresponding time of Advent. Advent is a time for preparation, and, though it is also easy to forget, it is also a penitential time for the Church. Since it is both preparatory and penitential we must prepare for the great gift of Christmas by penance – chiefly a penance of waiting. By our Advent waiting, introspection, and humility in preparation for the great Gift we were about to receive we emptied ourselves out to be filled with that Gift in order to receive the only present we ever really need. We took this lesson with us to Lent, and we began to empty ourselves again, but this time we gave up everything. Not even our very lives were left off the list. Given all of what I covered connecting Advent and Christmas to Lent and Easter, where am I going with this and what it does all mean practically for the day-to-day spiritual life of Catholics? 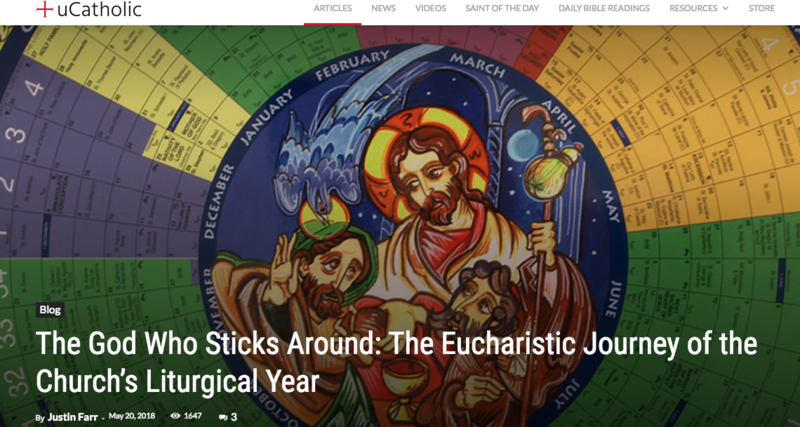 Well, I believe the Church’s calendar takes us on a Eucharistic journey in which all the seasons are connected beautifully by what happens on the altar. And what is begun at Christmas matures at Easter and takes us all the way to the Feast of Christ the King. To get at this we must look towards the altar and what enters our bodies as a result of what happens on the altar. When the words of institution are spoken and bread and wine are consecrated into Jesus, the Flesh born on the altar is the same Flesh born at Christmas, the same Flesh that died at Calvary, and the same Flesh that rose from the dead. If “Christmas” means, most fundamentally, the Word becoming flesh and dwelling among men, then “Easter” must mean the Word becoming flesh and lifting men up to dwell with God. Just as I penned in 2016, “Every time we receive the Eucharist we have the chance to make a manger in our souls for Jesus to dwell, be born, and bring life to our souls. We have the chance to become little “Marys” and hold the incarnate Word within us. By the use of Jesus’s words during the consecration the bread and wine become the very same flesh of the Incarnation and dwells amongst us in the earthen vessels of our bodies. Christmas comes to be, quite literally, in us” with all of the same secrecy and silence, this time behind the appearances of bread and wine. And every time we receive the Eucharist we create a chance for the Risen Lord to descend into the hades of souls and pull out what is good and just sanctifying us as He rescues us out of separation into reconciliation with God. Easter too comes to be quite literally in us as well. Easter too comes to be quite literally in us as well. Moreover, the New Life of Christmas foreshadows the New Life of Easter birthed at the other time of the liturgical year and even prefigures the greater magnitude of it. The New Life of the Birth of Jesus foreshadows both the New Life of His Resurrection and our New Life gained through faith in Him. Furthermore, the New Life of the Resurrection foreshadows the New Life of the complete resurrection of all life at the culmination of existence itself when all redeemed life is reunited with God at the end of time. Christmas sent Jesus on the way to Calvary, to Good Friday. So Christmas must send us on our way to ours as well – to our suffering passions during Lent, to our deaths on Good Friday, and finally to, if we are faithful to God, our resurrection Easter morning. If all this is true, we have no other choice but to live the Risen Flesh that we ingest. The Risen Christ appears in the hand of the priest, and then He visits us like He did the 500 witnesses when we come up to receive communion. Then, a Pentecost happens. He endows us the Holy Spirit when we receive the Eucharist and then sends us out to preach, teach, and reach with the Good News of Easter – every Mass – every time. From Christmas to Easter, this is the God who comes to us and sticks around. Though He left by His Ascension, He remains with us in tabernacles, the ones made of refined gold and the ones made of redeemed flesh. When it comes to the Christian life lived through the Church’s liturgy, this is the God who foreshadows and plants the seeds at Christmas.